A cute amp driver with more tone tweaking than many clones on the market. Good value for money. Various tonal shaping options. Same chip as a TS. 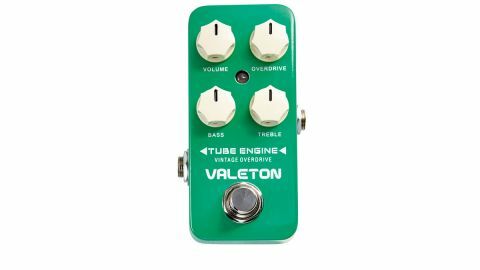 Several of the pedals Valeton's new Coral series have Modern or Vintage as a prefix, including two overdrive pedals. "It delivers familiar TS-808-style mild overdrive that will add a natural increase in dirt to your amp"
The Tube Engine Vintage Overdrive colour and name, of course, allude to the fact that it takes its cue from the Tube Screamer, being based around the same JRC4558 chip. In use, it delivers familiar TS-808-style mild overdrive that will add a natural increase in dirt to your amp. The differences between TS clones are usually subtle and centre on the midrange, but this one has treble and bass knobs offering more variability than a single-knob design, particularly in getting away from a TS's natural bass roll-off by fattening up the bottom end. We've seen Tube Screamer clones such as the Joyo JF-01 that sell for less, but this is good value at £39, not least for its extra EQ options.